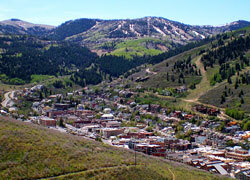 The Old Town district is the original heart of Park City and remains so to this day. 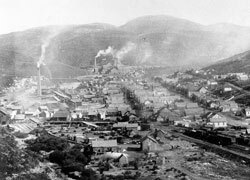 When silver was discovered in the mountains surrounding Park City after the Civil War, coal was needed to fuel the pumps that removed water from underground mines. Completed in 1880, the Utah Eastern Railroad constructed a spur line to transport coal from Echo, located in eastern Summit County, through the aptly named Coalville to the Park City mines. This “Echo Spur” rail line was the original roadbed of Rossie Hill Drive, and ran up Marsac Avenue to Randolph Hearst’s famed Ontario mine. While the tracks were removed many years ago, it is an important chapter in the mining legacy of Park City. The fact that Echo Spur seeks to be a energy efficient community located where coal once powered silver mining is a happy ending to what began as a less than environmentally friendly story. Where locomotives once belched out black smoke, our homes will use solar energy to power efficient systems to provide electricity, warmth, and hot water to our homeowners. Super-insulated walls will reduce the load for air conditioning and heating. And instead of relying on carbon based energy sources for heat and light, our infill development calls for building homes that will use modern building strategies to provide a clean and comfortable living environment for our homeowners.